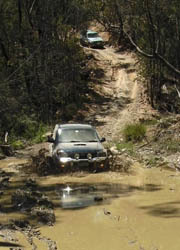 Fords crossing is on Ractliffe track, where it crosses the river it has a steep bank on the north side thats rocky, and the south side is smooth and ramp like..The water was around 2 ft deep when i drove thru it in may 08.This Track is seasonally closed! Added by Discotwo: I Drove both from North to South and then South to North on 9/11/11. The track was dry and quite manageable for a Newbie like me. The creek was just a trickle. I am looking forward to trying this track out after some heavy rains.No sign of the fallen tree mentioned earlier.